In the area of histology, EUROIMMUN has a unique expertise. The company’s Business Division Immunofluorescence deals with serological autoantibody diagnostics using tissue sections and is specialised on the fully automated processing of these analyses. The respective test systems are used worldwide, their share of the company’s total revenues (240 million euros in the year 2016) amounts to approximately one third. In pathohistochemistry, one of EUROIMUN’s new focuses, however, it is not the serum that is analysed on the basis of tissue sections, but the tissue itself: The properties of histological samples and their reactivity with defined antibodies or other reagents are analysed and microscopically evaluated. The EUROTide incubation technique and the BIOCHIP technology enable us to modernise or revolutionise pathohistochemistry. These technologies are unique features of EUROIMMUN. They are supplemented by an arsenal of further new developments, which, in combination with EUROPath, will be groundbreaking for diagnostics. We want to become a worldwide leader in this area, just as in the field of autoimmune diagnostics. EUROPath is based on several proven inventions in whose development EUROIMMUN employees played an essential role: the TITERPLANE technique, MERGITE!, EUROTide, BIOCHIP technology, chemical activation of the slide surface, and Computer-Aided Immunofluorescence Microscopy (CAIFM). Moreover, several new strategies are applied in EUROPath, for example: the fully automated dyeing platform EP-Dx, recombinant production of substrates for function control of the reagents, EUROPath microscopy and EUROPathOffice as a special version of the established EUROLabOffice software used in serological laboratories, crypto-coding for BIOCHIP glass foils, laser perforation of slides (predetermined breaking point), mounting by using cover glasses coated with synthetic resin paint or by means of well-known techniques of the BIOCHIP production. The first patent application of EUROIMMUN’s founder was for the TITERPLANE technique. It uses two flat analysis plates with opposite hydrophilic reaction fields for histochemical or other reactions in liquid. Samples or reagents are pipetted onto reagent trays and subsequently, slides are placed from above into the spaces of the reagent trays, so that the tissue sections or other substrates facing the fields of the reagent tray come into contact with the droplets. As the fluids are confined in a closed space, there is no need for a conventional humidity chamber. The fact that the reactions start simultaneously helps to standardise analytics (1). MERGITE! (Dive in!, 22) completes the concept which started with the TITERPLANE technique. The slides which are incubated upside down are not turned over in the washing process. They are positioned in racks, with the reaction fields facing upside down. The frame features stalagmite-like appendages, whose plane surfaces lie opposite the reaction fields at a distance of one third of a millimetre. PBS streams out of the centre of these appendages at a slow rate. The PBS moves by laminar flow over the substrates to the outer edges and runs down, without the liquids of neighbouring samples in the reaction area mixing together. One wash step only takes 15 seconds! The surface of the slides outside of the reaction fields remains dry. Beakers, cuvettes and kilometres of paper towels are now obsolete! MERGITE! can also be integrated in a fully automated workflow. This was actually the last hurdle for immunohistochemistry. Today, the technique is able to compete with the many other immunobiochemical analysis techniques. EUROTide is a further development of the TITERPLANE technique. Solid phase substrates are arranged on oblong adhesion surfaces of a slide and, from above, brought into contact with the fluids which are in the channels of the reagent tray, exactly opposite the adhesion surfaces. During the incubation, the arrangement is constantly tilted form one side to the other at a slow pace, which causes a strong convection in the fluids, thus resulting in a very effective mixing of the reactants (13). Diffusion gradients are permanently reduced and the reactions are quicker and stronger. Without movement of the liquid, a colour crystal needs several hours to dissolve. With EUROTide, however, it only takes a few seconds. In autoimmune diagnostics, tenfold higher titers are obtained with EUROTide than with the conventional incubation (28). The reactivity of each substrate is more consistent over the whole surface than with the former state of the art. If several samples are analysed separately next to each other, the arrangement prevents the fluids from adjacent samples from mixing during the incubation. The fact that in TITERPLANE, EUROTide and MERGITE! the tissue sections are immersed from above into the liquid samples or reagents enhances the analytical quality. The tissue sections remain humid during the incubation and the washing procedures, and the fluids do not run off at the sides. With conventional incubation, disturbing factors may sometimes occur due to the drying process. The salt concentration in the remaining liquid increases, sometimes extremely, and the cells of the tissues are osmotically drained so that their content is partly released into the environment. Sometimes salt crystals form in the tissue or the cells, which destroy the morphology. With conventional incubation, it can also occur that tissue is squeezed by surface tension, or disturbing particles accumulate when the surface of the liquid is lowered into the tissue (Something similar can be observed when having a cup of tea. Often the tea is covered by an extremely fine film which sticks to the inner wall of the cup, when it is tilted. This build-up cannot be removed by washing, and can only be mechanically eliminated, which is not possible in immunohistochemistry). The invention of the BIOCHIPs was the commercial basis for the company EUROIMMUN, founded in 1987 (Stöcker, 3, 7 and 10). BIOCHIPs are used in autoimmune diagnostics by means of indirect immunofluorescence test, but are also suitable for diagnostics in the pathohistochemical laboratory. Tissue sections are brought onto thin glass foils and then cut out, together with the glass, as a whole or in fragments (BIOCHIPs). These are then glued on to slides. 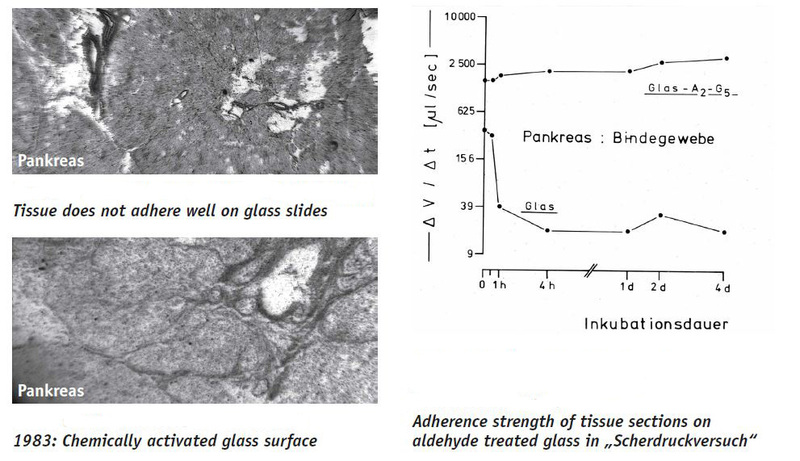 The chemical activation of the glass surface which is nowadays common in every pathohistochemical laboratory is also based on one of our inventions: The tissue sections are fixed in the glass by covalent bridges, so that they adhere a hundredfold better. They do not float away during the incubations and the structures are preserved better (4). For mass production we nowadays apply a plasma treatment to the slides and covalently couple different agents to the glass surface. 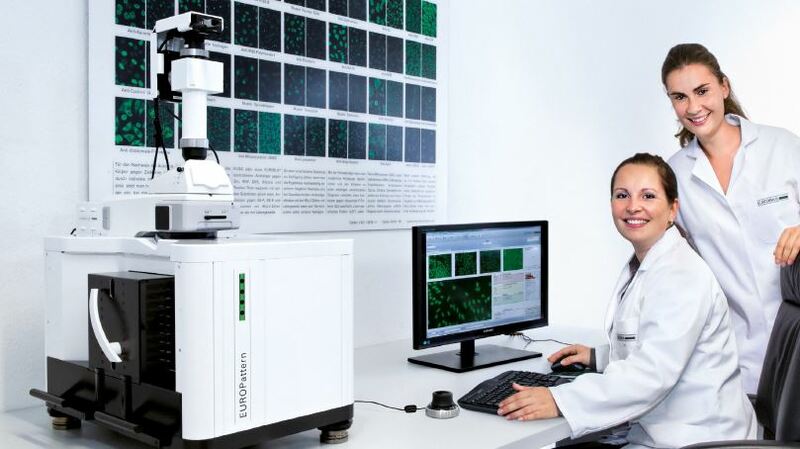 EUROIMMUN innovations include LED-equipped calibrated light sources for fluorescence microscopy (9), with which the company equipped thousands of Zeiss microscopes that are now used worldwide. These replace the mercury vapour lamps as they are cheaper, have a life-time of 40,000 instead of 100 hours, do not emit UV radiation, only develop little heat, can be controlled, and only cost some cents, and not a hundred euros. Previously, in automated microscopy, it was necessary to switch from fluorescence excitation to white light for every image during the focusing to the image level in order to prevent the bleaching of the fluorochrome (11, 14). Today, the focusing only takes a split second and requires an extremely little amount of light, so that this step can be omitted. Computer-aided immunofluorescence microscopy (CAIFM) is another important contribution of EUROIMMUN to autoimmune and infection diagnostics. The incubated slides are transported subsequently from a magazine with 50 or 100 ten-field slides and placed under the objective of a microscope, the images are taken digitally and are automatically evaluated by a pattern recognition software. Optionally, the user can operate the microscope interactively from the desk and evaluate the reactions displayed on the screen without having to move. A dark room is also no longer required (12). For the exact identification of every single one of the slides to be investigated and for the description of many characteristics which are important for analytics, such as sort, lot, expiry date, and others, they are labelled with a specific code (15). In case the slides are still visually evaluated, the results can be recorded by language recognition or shortcuts. With respect to microscopy techniques, EUROIMMUN has made huge progress in recent years which can also be applied in pathology (17, 18, 25). In a cooperation with Prof Martinetz from the University of Lübeck and his colleagues, the best microscope worldwide for autoimmune diagnostics, which is selling extremely well. The EUROTide function and the BIOCHIPbased handling of tissue sections for histochemistry are the main features of the EUROPath Technology. The EUROPath reagent tray has a flat concave base. By placing a slide on the tray (with the tissue sections facing downwards), an incubation chamber is formed, which is largely closed and does not allow any noteworthy evaporation. Steady tilting, preferably in the longitudinal direction permanently causes a strong convection (EUROTide, alternating high and low tide). This accelerates the reactions, intensifies the signals and shortens the incubation time. The required amount of reagents is reduced to a third (26)! The forced convection in EUROTide delivers excellent dyeing results. The arrangement does not require any complicated coating of the slides with oil for the incubation (in the Roche system (Ventana) this is done to prevent the fluid from drying, while an air stream is applied to cause waves in order to create movement in the preparation). Slide and reagent tray remain joined together from the start of the incubation to the last washing step, but the incubation area can still be accessed via channels. In the washing procedure, liquid is added and sucked off in a timesaving manner, simultaneously or alternating in quick succession. EUROPath reagent trays are temperature-stable up to 110ºC, resistant against dyes and solvents, and easy to clean. With EUROTide, both BIOCHIP carriers and normal standard slides with conventionally produced tissue sections of different, arbitrary sizes can be used. The BIOCHIP technology provides the option of focusing on the diagnostically relevant parts of histological samples: Tissue sections are fixed on glass foils and, in this composition, fragmented into BIOCHIPs. Only those structures which are important for the analysis are cut out of the tissue sections and then incubated according to the EUROTide principle. In this way, only the actually required amount of tissue is analysed, space and reagents are saved, and no time is lost by investigating the unnecessary parts under the microscope. Complete, large tissue sections can by analysed as well as small ones. Today, EUROIMMUN has different devices for the optical recording of tissue structures (scanners) as well as fully automated BIOCHIP fragmenting and assembling devices which have been developed in-house and produced by our own engineering department (29). If only little tissue is available, e.g. after biopsy, it can be first completely processed into tissue sections and brought on to glass foils. Afterwards, the tissue is fragmented into BIOCHIPs together with the glass foil and glued onto slides. This is done in such a way that as many individual substrates as possible containing the relevant structures are obtained. The remaining coated glass foils are sealed in bags or packed in blister and preserved in liquid nitrogen. In order to produce tissue arrays, each tissue sample is cut individually and processed separately into BIOCHIPs, which are then combined to BIOCHIP mosaics. A maximal amount of usable substrate can be obtained even from the smallest biopsies, which is a large advantage when there is not much tissue available. If the tissue contains individual nests with interesting structures, it is possible to extract them and to evaluate only the relevant parts at the microscope. Only perfect BIOCHIPs are used and every mosaic is qualitatively perfect, a large advantage compared to the conventional “mortadella” preparations, where tissue pieces combined in paraffine blocks are cut with the microtome (Poschmann et al. 5, Stöcker et al. 6, Thorns et al. 8). Unlike with the paraffine sections, there is no feasible alternative for comprehensive tissue arrays from frozen tissue sections to BIOCHIP Mosaics. It is possible to freeze several organ pieces together and cut them as a package into frozen tissue sections in the cryotome (“mixed tissues”). However, this conventional technique is limited since the tissues have different characteristics when cut. For example, each organ has its own optimal temperature or sometimes, the cutting thickness must be adjusted if the stability of the tissue varies or the cutting level used for each organ need readjusting, which is difficult in mixed tissues. If every organ is cut individually and processed to BIOCHIPs, a significantly higher amount of usable substrates is obtained and it is possible to be flexible if arrays with different combinations are required (according to the requested analyses or time point). The BIOCHIP technology also allows to conveniently and systematically extract microsections from tissue sections. For example, BIOCHIPs with an edge length of 0.1 mm were used in polymerase chain reactions in order to determine genetic characteristics in certain cell groups. 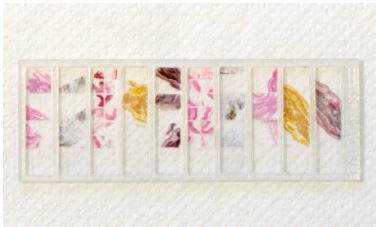 After completion of the incubations, all the differently stained and treated BIOCHIPs from one patient are combined together on a slide and treated with mounting medium. This makes the evaluation at the microscope much easier for the pathologist. For comparative analyses, BIOCHIP Mosaics can be produced combining tissue sections from a hundred different tumours. For secure identification of each individual BIOCHIP, a sufficient number of codes can be engraved 40 μm underneath the surface of the carrier glass using a CO2-LASER, so that each BIOCHIP has at least one ID which is resistant to solvents and which the microscope can read automatically (crypto code, 21). The tissue sections are brought onto cryptocoded carrier glasses, the relevant structures are identified, the fragment size defined, the relevant BIOCHIPs cut out automatically and made available for histochemical analysis. The fully automated dyeing platform “EUROPath Analyzer EP-Dx” is an essential element of the EUROPath technology. It is based on the EUROTide incubation technique and is characterised by brilliant staining, a low consumption of reagents and secure sample identification. This device is versatile and will bring a breath of fresh air to the diagnostics in the pathological institutes (19, 20). EUROIMMUN’s engineers were able to benefit from a large pool of experience when they developed EP-Dx. In the past, they invented and launched over 70 different analysis instruments and production devices, amongst them all fully automated systems for the production of BIOCHIPs (10, 29), a large random-access instrument for bead-based immunotests (24), the fully automated system EUROTide for indirect immunofluorescence and micro-immunoblots, the pipetting device EUROLabLiquid- Handler, and, derived thereof, a fully automated “Workstation”, hundreds of which will soon be used in the largest laboratories worldwide, and, last but not least, the MERGITE! system for fast and reproducible washing of slides. Several EP-Dx prototype generations are currently being throroughly tested at the EUROIMMUN subsidiary in Dassow. Up to 1000 tissue samples can be analysed next to each other, at one station by using up to 50 different staining protocols and within less than three hours per analysis. In comparison to the conventional processing, EP-Dx causes stronger reactions and only requires a third of the (often very expensive) reagent. EP-Dx is flexible and open, the user can apply their own antibodies for immunohistochemistry. EP-Dx is a modular system based on EUROIMMUN’s EUROLabLiquidHandler. The working area is completely closed, the exhaust air is filtered and controlled and it does not smell of organic solvent as is usually the case in pathological laboratories. The EUROTide function is achieved by the tilting modules, which the reagent trays are placed on. The loading of the individual rockers with the patient samples is monitored by a digital reader system. The washing is performed with up to ten different wash buffers. The reagent racks are loaded into the platform in a defined grid pattern via a rail system. The reagents carry ID codes and are automatically identified by a scanner during the loading procedure. The loading of the device is supported by different optical displays and is designed to avoid mix-ups. A 5-needle pipetting module transfers the liquids by highly precise aspiration and dispensing processes and also produces dilutions. Each needle is controlled separately and each channel has a capacitative liquid level detection. The needles are effectively cleaned from the outside and the inside after each pipetting step. Both organic as well as aqueous solvents are used in the washing. Inflammable liquids are safely stored in an actively ventilated safety cabinet. Toxic waste is collected separately. The dyeing device is operated via a software with an intuitive user interface and touch screen and is suitable for random-access technology. The user is guided through the planning of the work list, the loading procedure, and the subsequent run by Support graphic displays. The required master data and assays are saved in a database. The software works independently, but can also be connected with other laboratory software for the transfer of protocols and results. In pathohistochemistry, it must be confirmed that the techniques were correctly applied and the reagents used for staining worked correctly. This is done by including human control substrates in each incubation. Authentic human material, however, is not available everywhere and its use is sometimes considered as not legitimate. In EUROIMMUN’s molecular biological laboratories, the respective antigens are produced recombinantly for BIOCHIPs or readily assembled slides. Different expression systems have been established at EUROIMMUN, based on baker’s yeast, insect and mammal cells. Especially for the production of authentic autoantigens, the use of human expression systems is an important prerequisite. We benefit from this expertise in the determination of autoantibodies against components of the brain. Here, EUROIMMUN has gained an excellent reputation throughout the world (23, 27, 28, 30, 31, 32). EUROIMMUN’s organisation software EUROLabOffice, which is well-established in serological laboratories, is customised to the requirements of pathohistochemistry in order to facilitate work processes and to standardise diagnostics. Many conservative pathology institutes are still lagging behind significantly in this field. Microscopic images are increasingly recorded, processed and archived by automated microscopes. In cooperation with the University of Luebeck, EUROIMMUN is working on methods of pattern recognition which shall allow, among other things, to virtually bring differently stained serial sections into alignment. An enormous auto-didactic three-dimensional software shall provide fully automated microscopy for pathologists in the near future (33, 34). The market leader Roche/Ventana offers several devices for pathology automation: “Symphony” deparaffinises and offers automated HEoverview staining and special stains. Moreover, scanners and a software for the pathology laboratory are available (tele-pathology). Roche/Ventana uses the so-called “Liquid Coverslip” technology: The incubation preparation is coated with oil to avoid drying, controlled air streams move the surface, and, in this complicated way, create convection. In the technology applied by Leica, a “Covertile” is exactly fitted to create a capillary gap as a reaction space in order to avoid evaporation of the reagents. Heat treatment is difficult, the distribution of the incubation solutions is irregular and there is no convection. The “Xmatrx System ULTRA“ and “Xmatrx ELITE“ from Biogenex are fully automated dyeing systems for IHC, ISH, fluorescence in situ hybridisation (FISH), in situ PCR and special stains on slides. ThermoFisher sells automated embedding systems and automated systems for removal of paraffine and antigen re-production for IHC. The “Labvision Autostainer“ performs IHC and special stains and can process a large number of slides in parallel. The instrument “Omnis“ from Dako encompasses IHC and ISH on one device with removal of paraffine, and counterstaining. There is another device from Dako exclusively for IHC. The “Hybridizer“ performs fluorescence and chromogen in situ hybridisation (FISH, CISH). 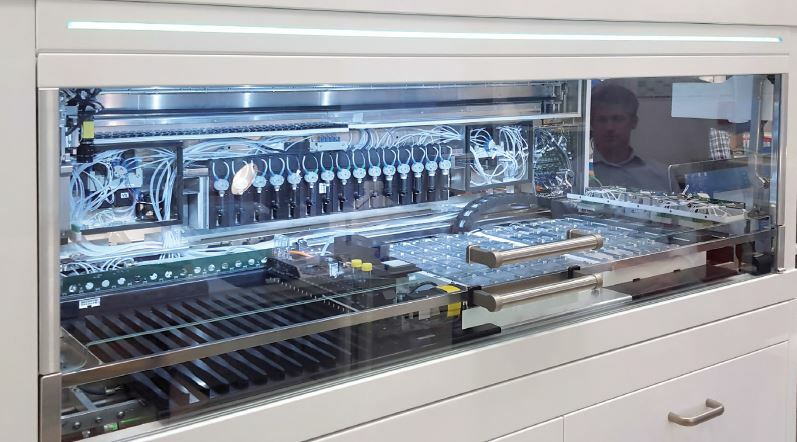 “Artisan-Link“ enables fully automated special stains. However, only defined processes are possible, similar as in Thermo- Fisher’s “Gemini” system. Leica Biosystems offers the fully automed staining device “BOND-MAXe“ for IHC and ISH. Moreover, slide printers and cassettes are offered, as well as tissue infiltration devices, embedding systems, different microtomes, microscopes and scanners, software for digital evaluation and documentation. A so-called “Workstation” carries out automatically dyeing and embedding. Sakura Finetek offers the so-called “SMART Automation“ – for cutting of tissue sections, draining, dyeing, and embedding. Several cuts and stains are displayed next to each other on the screen. All these technical automation approaches have in common that devices, reagents and consumables are altogether more expensive than in the manual methods. The savings in personnel costs are opposed to high acquisition costs and operation expenses. Stöcker W. Vorrichtung zur Durchführung von Mikroanalysen. Patent EP 0018435 (1979). TITERPLANE-Technik. Stöcker W. Verfahren und Vorrichtungen für Untersuchungen an unbeweglich gemachtem biologischem Material. Patent Nr. 0 117 262 (1983). BIOCHIP-Technologie. Stöcker W. Rationelle Histochemie mit einer neuen Mikroanalysemethode. Acta histochem Suppl 31: 269-281 (1985). Erste Originalmitteilung der BIOCHIP-Technologie. Stöcker K, Stöcker W, Ritter-Frank Y, Scriba PC. Chemisch-aktivierte Glasobjektträger für Gefrierschnitte und ihre Anwendung in der Autoantikörperdiagnostik. Acta histochem (Jena) Suppl 31: 283-294 (1985). Poschmann A, Seitz C, Bein G, Böcker W, Geusendam G, Stöcker W. Rapid histochemical screening of monoclonal antibodies against tumor associated and other antigens using the „Titerplane-technique“. Immunobiol 170: 72-73 (1985). Stöcker W, Poschmann A, Seitz C, Heise R, Hornof B, Böcker W. Rationelles Screening von Fusionsüberständen zum histochemischen Nachweis monoklonaler Antikörper gegen Tumor-assoziierte und andere Antigene. Verh dtsch Ges Path 70: 393-395 (1986). Stöcker W. Die BIOCHIP-Technologie: Ein neuer Weg der Produktion Festphasegebundener Bioreagenzien für das medizinische und biologische Laboratorium. Dokumentation zur (erfolgreichen) Bewerbung um den vom Wirtschaftsminister des Landes Schleswig-Holstein überreichten Schmidt-Römhild-Technologiepreis 1989. Festveranstaltung am 10. November 1989 im Audienzsaal des Lübecker Rathauses. Thorns C, Noack F, Feller AC, Merz H, Stöcker W, Müller-Kunert E, Bernd H-W. Application of newly developed tissue-arrays to study EMMPRIN (CD147) ex-pression malignant non-Hodgkin lymphoma. Cancer Genomics & Proteomics 1: 45-52 (2004). Morrin M, Müller M, Wessel S, Rateike M, Stöcker W. Lichtquelle für ein Auflicht- Fluoreszenzmikroskop. Gebrauchsmuster DE 20 2004 010 121 (2004). LED für die Immunfluoreszenz. Stöcker W, Rateike M, Morrin M. Verfahren zur Herstellung Festphasen-gebundener Bioreagenzien. Patent DE 102004005100 (2004) und WO 2005/073693 (2005). Vollautomatisierung der BIOCHIP-Technologie. Stöcker W, Wessel S, Morrin M, Müller M. Konstante Lichtquelle für die Fluoreszenzmikroskopie. Deutsche Patentanmeldung DE 10 2006 027 518.7 (2006). LED für die Immunfluoreszenz. Stöcker W, Fauer H, Krause C, Barth E, Martinetz T. Verfahren zur Optimierung der automatischen Fluoreszenzerkennung in der Immundiagnostik. EP 2 030 001 (2007). Mustererkennung mikroskopischer Bilder. Stöcker W, Rateike M, Maltzahn B, Behring R. Analyseverfahren und Vorrichtung für biologische Reaktionen zwischen einer flüssigen und einer festen Phase. Patent EP 2 191 893 (2008). EUROtide. Morrin M. Vorrichtung und Verfahren zur automatischen Fokussierung für die Mikroskopie schwach leuchtender Substrate. Patent DE 10 2010 035 104.0 (2010) und WO 2012/025220 (2011). NN. Objektträger. Gebrauchsmuster DE 20 2011 005 278 (2011). Codierter Objektträger mit Informationen über Charge und sonstige Eigenschaften. Stöcker W, Ehling T. Vorrichtung und Verfahren zur Untersuchung einer biologischen Probe. Patentanmeldung DE 10 2011 011 795.4 (2011). Befund-Protokollierung beim Mikroskopieren durch Spracherkennung oder Tastatur-Kürzel. Dabei Korrelierung der Kreuztisch-Position mit der Befund-Adresse. Voigt J, Krause C, Rohwäder E, Saschenbrecker S, Hahn M, Danckwardt M, Feirer C, Ens K, Fechner K, Barth E, Martinetz T, Stöcker W. Automated indirect immunofluorescence evaluation of antinuclear autoantibodies on HEp-2 cells. Clin Dev Immunol, doi: 10.1155/2012/651058 [Epub] (2012). Hochstrate N, Krause C, Ens K, Voigt J. ANA and ANCA diagnostics with computeraided immunofluorescence microscopy (CAIFM). Zeitschrift für Rheumatologie 72: 24·(2013). Stöcker W, Rottmann N. Verfahren sowie Vorrichtung zur Inkubation von Patentientenproben. Patentanmeldung DE 10 2012 013 680 (2012) und WO 2014/009067 (2013). EUROTide für die Pathologie. Stöcker W, Rottmann N. Verfahren und Analysevorrichtung zur mikroskopischen Untersuchung eines Gewebeschnittes oder eines Zellausstriches. Patentanmeldung DE 10 2012 013 678 (2012) und WO 2014/009066 (2013). Flexible Anordnung von Gewebeschnitten, BIOCHIPs und Kontrollmaterial zur immunologischen bzw. histochemischen Untersuchung von Patientenproben. Rottmann N, Stöcker W, Koop N. Transparenter Objektträger mit Kennzeichnung. Patentanmeldung EP 2 896 458 (2014) und WO 2015/106774 (2014). Krypto-Codierung. Stöcker W. Verbesserte Vorrichtung und Verfahren für Reaktionen zwischen einer festen und einer flüssigen Phase. Patentanmeldung DE 10 2014 001 481 (2014) und WO 2015/62715 (2014). MERGITE! Ein Bidet zum Waschen für die Immunhistochemie. Jarius S, Scharf M, Begemann N, Stöcker W, Probst C, Serysheva II, Nagel S, Graus F, Psimaras D, Wildemann B, Komorowski L. Antibodies to the inositol 1,4,5-trisphosphate receptor type 1 (ITPR1) in cerebellar ataxia. J Neuroin-flammation 11: 206-2017 (2014). Stöcker W, Kowtun A, Maltzahn B, Koschinat L, Richter L. Verfahren und Vorrichtung zur Überführung von Flüssigkeiten. Patentanmeldung EP 2 959 971 (2014) und WO 2015/197176 (2015). Portionierte Reagenzien in Kapillaren. Krause C, Ens K, Fechner K, Voigt J, Fraune J, Rohwäder E, Hahn M, Danckwardt M, Feirer C, Barth E, Martinetz T, Stoecker W. EUROPattern-Suite technology for computer-aided immunofluorescence microscopy in autoantibody diagnostics. Lupus 24: 516-529 (2015). Kaffka C. Inkubationsrinne. Patentanmeldung WO2016/169576 (2015) und EP3085446 (2015). EUROPath-Reagenzträger. Scharf M, Miske R, Heidenreich F, Giess R, Landwehr P, Blöcker IM, Begemann N, Denno Y, Tiede S, Dähnrich C, Schlumberger W, Unger M, Teegen B, Stöcker W, Probst C, Komorowski L. Neuronal Na(+)/K(+) ATPase is an autoantibody target in paraneoplastic neurological syndrome. Neurology 84: 1673-1679 (2015). Lemcke S, Sokolowski S, Rieckhoff N, Buschtez M, Kaffka C, Winter-Keil A, Schaller C, Rottmann N, Sadik CD, Stöcker W, Zillikens D, Schmidt E. Automated direct immunofluorescence analyses of skin biopsies. J Cutan Pathol 43(3): 227-235 (2015). Eggert L. Traction arrangement. Patentanmeldung EP3106713 (2015) und WO2016/202448 (2016). Differentialgetriebe für den synchronen X-Y-Antrieb von Positionier-Tischen per Zahnriemen mit zwei beliebigen Antriebsmotoren. Miske R, Hahn S, Rosenkranz T, Müller M, Dettmann IM, Mindorf S, Denno Y, Brakopp S, Scharf M, Teegen B, Probst C, Melzer N, Meinck HM, Terborg C, Stöcker W, Komorowski L. Autoantibodies against glutamate receptor δ2 after allogenic stem cell transplantation. Neurol Neuroimmunol Neuroinflamm 3:e255 (2016). Miske R, Gross CC, Scharf M, Golombeck KS, Hartwig M, Bhatia U, Schulte-Mecklenbeck A, Bönte K, Strippel C, Schöls L, Synofzik M, Lohmann H, Dettmann IM, Deppe M, Mindorf S, Warnecke T, Denno Y, Teegen B, Probst C, Brakopp S, Wandinger KP, Wiendl H, Stöcker W, Meuth SG, Komorowski L, Melzer N. Neurochondrin is a neuronal target antigen in autoimmune cerebellar degeneration. Neurol Neuroimmunol Neuroinflamm 4(1):e307 (2016). Fraune J, Gerlach S, Renztsch K, Teegen B, Lederer S, Affeldt K, Fechner K, Danckwardt M, Voigt J, Probst C, Komorowski L, Stöcker W. Multiparametric serological testing in autoimmune encephalitis using computer-aided immunofluorescence microscopy (CAIFM). Autoimmun Rev 15(10):937-942 (2016). Feirer, C., Roznowicz, F., Paul, M., und Bernitt, E. Optical scanning arrangement and method. European patent application, filed 28.5.2017 (2017). Eine von mehreren Versionen des schnellen Mikroskop-Scannings.